Riviera Beach, FL (August 31, 2015) – Juvent Sports announced the addition of tennis legend Mats Wilander to their growing list of major sports figures who are finding joint pain relief after using their revolutionary Micro-Impact Platform™ . Wilander, winner of 7 Grand Slam titles, and former #1 men’s tennis player in the world said the “For the first time in over 20 years I am joint pain free. 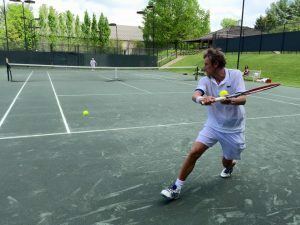 I no longer wear my knee braces that had been my constant companion for so many years and frankly I feel 20 years younger.” Wilander and his partner Cameron Lickle, nationally ranked collegiate player, host tennis camps (www.wilanderonwheels.com) around the world, so playing pain free is important. “My knees had been scoped several times and I was bone-on-bone in many places and was facing total knee replacements. I gave Juvent six weeks, and Juvent gave me my knees back – no more knee pain and knee braces on or off the court. The Juvent Pro has helped my body immensely, and I highly encourage all tennis players to take the six week Juvent Challenge.” “The Juvent Challenge offers athletes with joint pain, a no risk, 6-week period for them to see if they get pain relief.” says Pierre Dommestrup, Juvent’s Director of Sales. Dommestrup is also a passionate tennis player and formerly national ranked player. 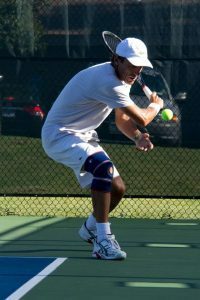 Mike Bryan, tennis doubles champion and Olympic Gold Medalist, is another champion that had significant joint pain relief and recommends Juvent. “Tennis is an intense sport that places tremendous demands on the feet, knees, hips, elbows, well… just about all of the joints and over time can result in significant joint wear and tear. Pain is usually the natural consequence of a successful tennis career. Until Juvent, drugs and surgery was the most common solution.” says Dommestrup. The Juvent Pro is an FDA Registered Class I medical exercise and rehabilitation device which delivers thousands of low-magnitude and high-frequency micro-impact pulses that enter through the heels of the feet and move up the entire body. These micro-impacts uniquely stimulate the body’s muscles and bones promoting circulation, joint health and healing. Users simply stand on the Juvent for as little as 10 minutes per day and many start feeling results within days. Recommended and used by world-renowned trainers, doctors, physical therapists, and chiropractors, the Juvent Pro is changing the way athletes are approaching training and recovery.